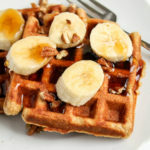 Slightly sweet and nutty banana waffles that are crispy on the outside, fluffy on the inside, and perfect for your weekend. Preheat waffle maker (I have this one) to highest setting, and preheat oven to 250 degrees F.
In a large bowl, whisk together flour, baking powder, cinnamon, nutmeg, and salt. In a medium bowl, mash the bananas and then whisk in egg, milk, and maple syrup until evenly blended. Slowly pour in coconut oil while whisking constantly, until fully combined. Pour wet ingredients into dry and fold together until no visible flour lumps remain (there may be a couple tiny ones). Do not over-mix! The mixture will be thick. Pour batter onto heated waffle iron and cook according to manufacturer's directions. I poured enough that it covered the center and most of the surface area of each waffle plate. Once the iron stops steaming and the waffle is golden brown, remove to a cooling rack. Place the waffles side by side, not on top of each other (to retain crispness), and keep warm in the oven while the rest of the waffles cook. Top with sliced banana, nuts, and maple syrup - or your preferred toppings! Store leftover waffles, wrapped individually in plastic wrap, in the freezer. To reheat, simply place frozen waffles in the toaster like an Eggo waffle.